yes, but a customer said me that his MA1's sound better that these files let think, so I am thinking to remove them. However, I am waiting that the other customers have their MA1's running to get other files, better than these ones. BTW comments (good and bad) are welcome on these files. As soon as I can get transformers from Jeff at Classic API, im going to be doing a shootout for guitars/drums/vocals/bass/horns with the pre's i have in my studio (including the MA1's...lots of others as well) Probably be done by the end of feb if shipping isnt delayed. EDIT: APP1040 is a preamp I have designed. It is basically a 312 pre with a DC servo integrator. Just a couple of notes for anyone looking to build these. 2) No hens teeth parts to find. Everything is pretty straight forward and easily procured. Im going to be doing a bit of a shootout with the pres in my studio, both commercial units as well as DIY to (hopefully) show the tonal variations and responses of the various pres. Ill post here and have a new thread once its all together. Initial tests of the unit are very interesting in a good way! yes, I agree with you, I am going to post a photo to indicate tgis two bridges to solder between these holes. yes, the circuit is simple. Moreover there are no DOA's inside. Just used the MA-1 on a session this past week. Used it on part of the drum kit and am using it for a bass track tonight. My ONLY complaint (or should I say request) would be for there to be a output trim on this bad boy. I'd LOVE to saturate the hell out of this puppy and see what she can spit out. Im thinkin, perhaps I can get rid of the DI and put a T-Pad in there. I'm planning on grabbing a couple in the next month or so and wanted to do this as well. Do you think it will physically fit where the di is? He left quite a bit of room there since the DI jack is NOT soldered directly TO the board. (so good thinking on PPA's part). Only issue might be securing it to the front panel since i think a 1/4" jack requires a larger bore than the T-Pad. Nothing a locking washer and nut cant handle im sure, but we'll see. I am thinking on a stepped attenuator for out. 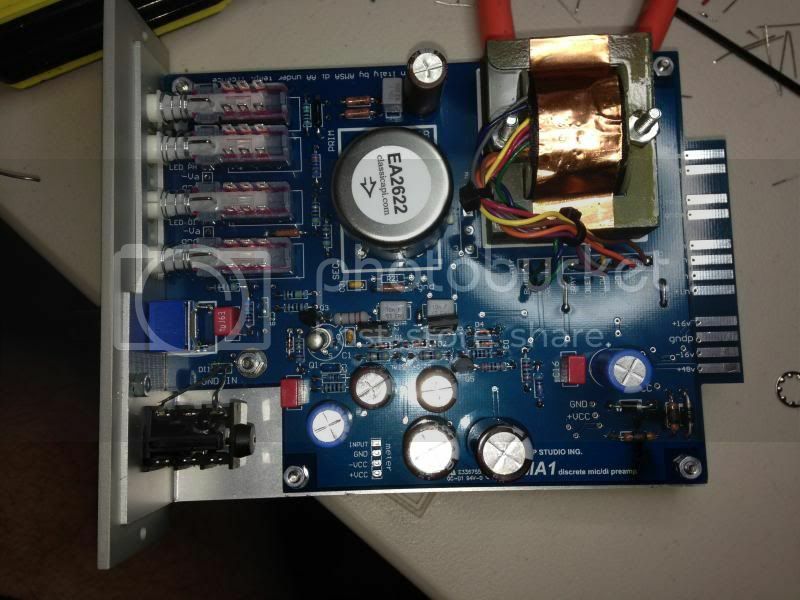 How much dB of attenuation are required? This is what I was suggesting to pier but explained myself so poorly. Can we add a t pad! I have not yet tested it on MA1 but theoretically is possible using it also here. The T-pad could be inserted into the MA1's DI hole in place of the jack connector. I have a pair of MA1s. How do you wire the T-Pads? 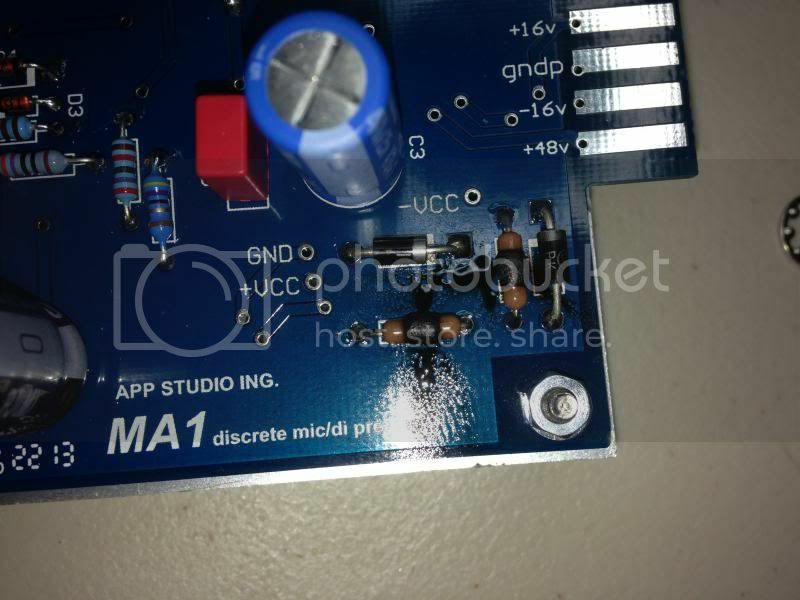 Anyone got any luck with using a t-pad with this circuit? Were you able to push it into some sort of overdrive or nice harmonic thingy? Anyone thought of having a feedback control ? Blew R31 and R29. 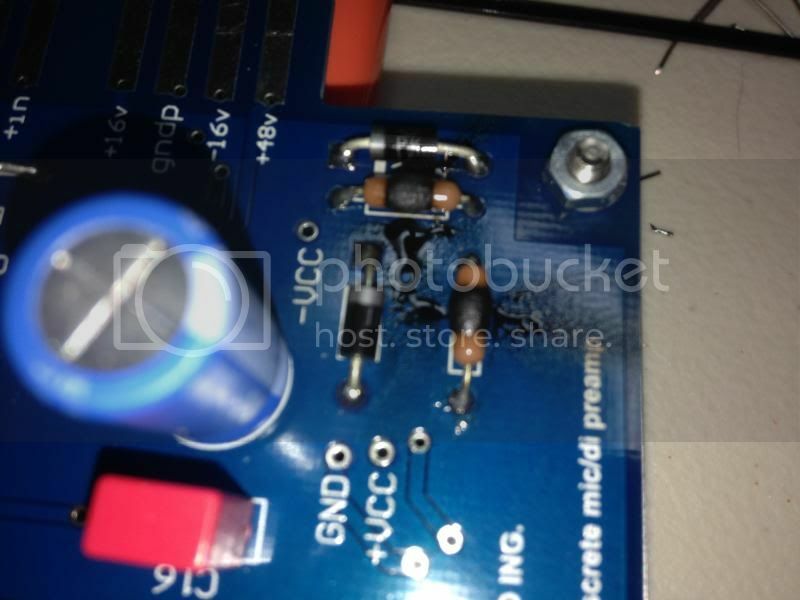 Anyone have any idea why these two resistors blew? The diodes seem to be in the right orientation. I followed the BOM, both 10 Ohm. Would it be possible that I inserted it into the 51X rack incorrectly? It blew the +16v fuse on my floor power supply. I'm praying it didn't f'up my other six modules or the rack. I'm thinking it may have misaligned and got into the 24V pins on the card edge connector. Thoughts? first all , you should check if Q4 and Q2 are inverted (Q2 in the place of Q4 and viceversa), please.